Ok, another night at Don’s Den of Iniquity and Cigars. I came after the gym, lit up my first cigar, and Don and I watched the Toronto Blue Jays beat the Baltimore Orioles 2-1. I didn’t care to blog while relaxing at first… especially since my first cigar was one I have already written about. My second cigar, which I lit at the end of the Ninth Inning, is a new one. I have smoked La Aurora before, but never the Escogidos. I asked Don for a smaller stick, and he gave me a blind choice of three. This is what I drew, and I am not disappointed yet. A lovely Dominican Maduro cigar, it is a robusto size, 5″ long by a 50 gauge. It lit easily, and gave me a lovely fruity taste right off the bat. 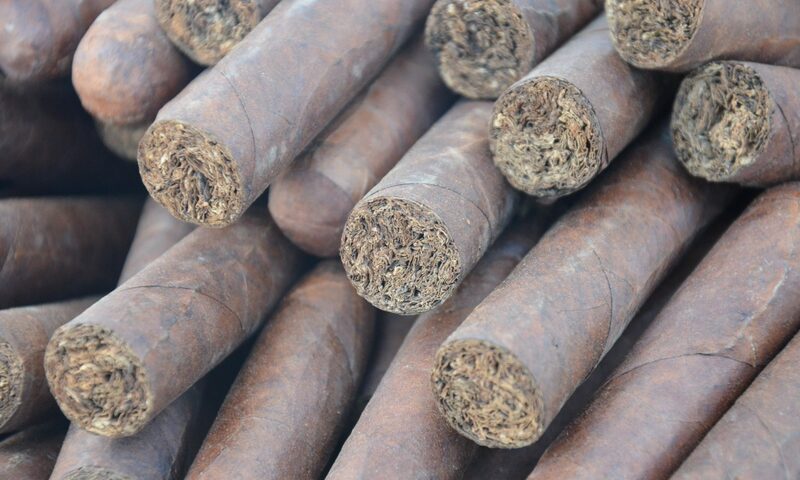 While the binder and filler are both Dominican, the wrapper is a Brazilian Meta Fino Maduro leaf, and the color is a rich, dark, almost chocolate color. I would call this a medium body cigar, and as it smokes I am getting a real subtle but solid peppery taste. The retrohale is stronger than I would expect from its taste, it would likely shock an amateur smoker not used to the feeling in the nose. I rather like it, but it definitely needs to be retrohaled carefully. After the game, Don found a documentary on the history of Scotch Whisky, and I am disappointed we do not have a good bottle of Lagavulin to pair with this increasingly spicy stick. I am not drinking tonight, so I do not have to settle for anything less. The scotch is missing, but the cigar is standing up well on its own. It is medium-strong, and it is burning well. It is not quite a laser straight burn, and I have twice dropped my ash. Oops! So the construction is not perfect, but it is a good smoke nonetheless. I have not had to relight once, and the taste, while morphing, is still quite pleasant. I am not usually a huge fan of Dominican cigars, but this one stands up well. At a reasonable price ($6-$7 per stick), I will give it a thumbs up. Not a celebratory cigar when you get a new high-paying job or a raise, but if you are looking for a box to hand out when your baby is born, this is worth a consideration. Previous PostPrevious CAO Pilon… Thanks Don! Next PostNext Bienvenido a la Habana!